Glowerz light up the night with their bright colors and have an automatic shut-off feature that makes them fall asleep when the child does! They are made of high-quality plush fabric and are machine washable so they can always stay cute and clean. Glowerz use LED lights that are safe and cool to the touch. They each display a rainbow of bright colors that are perfect for sleepovers, parties, or just getting up in the middle of the night for a drink. Glowerz have motion sensor technology that causes them to show the colors as soon as the child slides them on. The cost of Glowerz is $19.95 plus $7.95 shipping, for a total price of $27.9. Glowerz are powered off of LED lights, which last for hundreds of hours and are always safely cool to the touch. 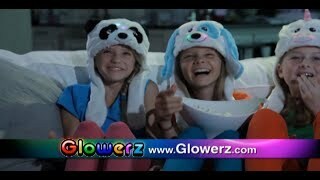 Glowerz broadcasts a wide array of colors while kids wear them because they are motion sensored. They are also equipped with an automatic shut-off feature so kids can fall asleep without worrying that they will burn out. Are the LED lights in Glowerz safe? What Glowerz characters are available? The following Glowerz characters are available: Vivid Unicorn, Brilliant Bear, Majestic Puppy, Blushing Ladybug, Shiny Panda, and Glowing Dragonfly. Yes, Glowerz are machine washable so they always stay cute and clean. Can I find Glowerz in stores? Glowerz are not available in stores. They can only be purchased through the official website. Glowerz are activated simply by touch, so children just need to slip them on and start playing and they will broadcast a beautiful array of vibrant colors. Make every movement more fun, see the colors of the rainbow as you walk, dance or jump! 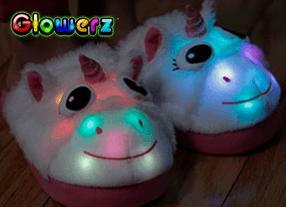 Glowerz are the magical color changing light up slippers that glow to life with each step! Glowerz are not available in stores!